AIRLINE PASSENGERS ARE BEING SPRAYED WITH TOXIC PESTICIDES: HERE’S WHAT YOU NEED TO KNOW | "Global Possibilities"
On my first trip to India about a decade ago, I distinctly remember when the plane landed, the interior of the aircraft was sprayed by the flight attendants — with all the passengers still in it. A vague announcement had been made beforehand, claiming everything needed to be disinfected. At the time, I wasn’t thrilled about some unknown aerosol being forced upon us, but promptly forgot about it. I never encountered it again during subsequent international air travel, and simply thought it was a fluke with that particular flight. Jump to the present and a series of articles have come across the news wire recently, bringing attention to the fact that the practice is alive and well. But it isn’t always obvious — often, the interior surfaces are treated with a residual spray before passengers board. As it turns out, the aerosol isn’t a disinfectant at all, but actually a pesticide and neurotoxin that has been linked to a range of health issues — like cancer, endocrine disruption and autoimmune disorders. The first question that comes to mind regarding the spraying of pesticides on airplanes is a resounding why? Why would insecticides be sprayed throughout a pressurized tube with recirculated air, where people — children, pregnant women and the elderly included — are captive for hours at a time? For the World Health Organization (WHO), the answer is simple: bugs. Those nasty pests who spread unpleasant diseases like malaria, dengue fever, yellow fever — and now the Zika Virus, as well as insects that can seriously damage crops. The practice is known as “disinsection” and it’s considered a public health measure, one that is mandated by International Health Regulations. Regular application of a residual insecticide to all internal surfaces of the aircraft [without passengers on-board], except those in food preparation areas. While the idea of controlling the transport of disease-carrying insects is understandable, the method can hardly be considered a safe, realistic solution — especially since the pesticides used are far from harmless. Phenothrin is a neurotoxin and can increase the risk of cancer, Parkinson’s disease, memory loss, and autoimmune disorders, such as lupus. It’s also one of the insecticides used to control pests on airplanes. Another class are synthetic pyrethroids — namely, permethrin and d-Phenothrin. Both are considered neurotoxins — and both are routinely used for disinsection. Incredibly, up until the 1970s, DEET was the toxin of choice for airplane cabins. 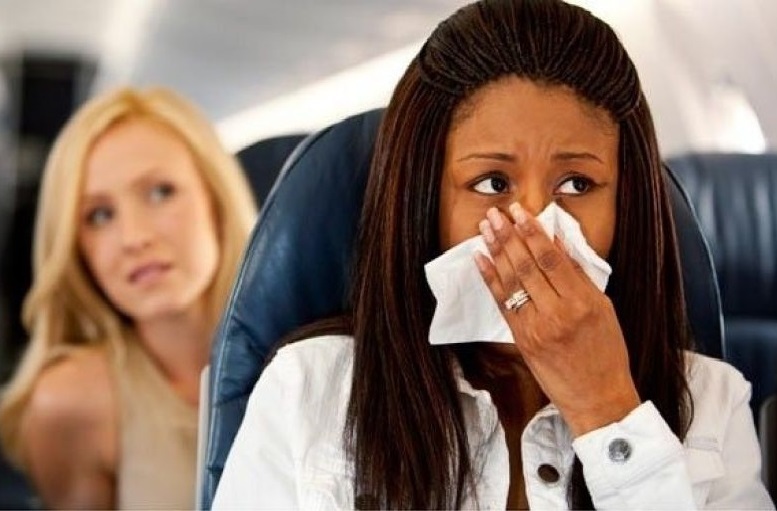 Passengers have reported negative reactions linked to the spraying, including: sinus problems, rashes and hives, headaches, respiratory issues and flu-like symptoms. Anaphylactic shock has also been documented. Countries requiring the disinsection of all in-bound flights but allowing, as an alternative to the above approach, either (a) the residual method or (b) the application of an aerosolized spray while passengers are not on-board. However, there have been many reports of spraying with passengers still on-board for flights into Australia. If you have a question about whether an upcoming flight is at risk for spraying, a list of airline representatives, who are familiar with disinsection requirements, can be found here. We can also pressure the airlines to adopt less toxic methods to deal with pests — like “air curtains” which blow air towards doorways to prevent insects from entering the plane. As it stands now, the airlines haven’t implemented the technology because it’s more costly than insecticides.